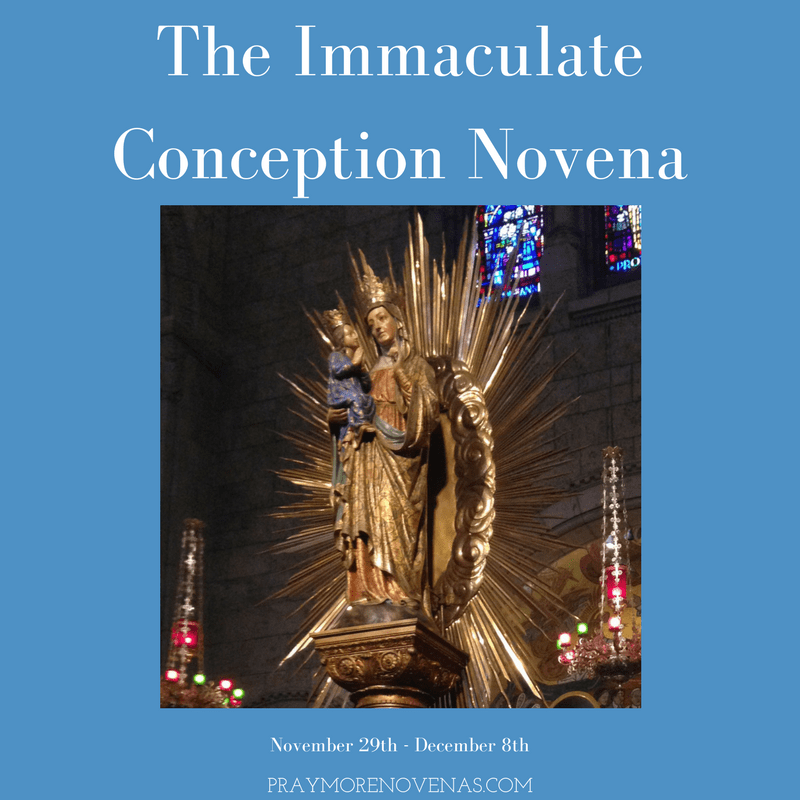 Here’s Day 2 of The Immaculate Conception Novena! Holy mother give David the blessing of a cure and strength to cope. In the name of the father. Amen. listen to my heart & hear my cry. I trust & believe with all my heart. Thanking you ahead of time..
Holy Immaculate Mary I pray this novena for my family esp my daughter & her children. They need to feel safe, secure & happy & to live a life without fear. You are my Heavenly Mother look over us. I pray for healing of my sister Sandra with end stage COPD and for a 2 year old little boy who has leukemia. Blessed Virgin bring my husband and children closer to you & help them to believe. My Holy Mother thank you for the strength to live a holy life. Please help my son settle into his career. Give him the strength, perseverence and confidence to persue. Please grant him a good friend to support him in his life. Thankyou for all the graces given to us! Pray that my family and my husband’s family will ALL be reunited one day soon. It would be so wonderful ~ maybe this Christmas? It has been many years. So much confusion and nonsense AND all for NO reason has kept us apart. Pride and Arrogance can destroy SO many families. St. Joseph pray for all who read this. My beautiful Immaculate Conception … You were a vision to me over 24 years ago. Everything you showed me has happened. I love you. You are my Mother. Holy Immaculate Mary, please grant that my son will be able to successfully complete his treatment program, overcome his abuse of alcohol and discover the peace and joy that only following your son, Our Lord Jesus, will bring. Dear Blessed Virgin, Mother of our Lord and Saviour Jesus Christ, I request that You pray for my family so that we will always be protected from harm and any form of sickness. Please Protect my children and help them in their Academic work. Above all help us to Know and Trust in Jesus more and more. We really do need the Lord in our lives. Amen. For my daughter’s pregnancy; for my son and his struggles – may he find compassion and love for himself; for income and for direction as I finish writing a book and may it help others break unhealthy generational cycles; for the place the Lord has promised me in San Francisco; for massive blessings for the family who has kept me from living on the streets; for all the intentions on this novena. I am praying for my son-in-law who has some medical issues that the doctors may determine what is wrong and how they will be able to cure him. Pray that I will keep my job and develop an outstanding desire to do my best at work. To write my book according to God’s will. Pray for Gee for peace and to change the evil hearts of her grandchildren. Pray for all in the Nursing Homes who are not being fed and/or cared for as they should. Mary conceived without sin please pray that the second cyst will go away. Mary conceived without sin please pray that the second cyst will go away and the first one will not come back. Also, I will have good news on the blood test that I took yesterday. Help the doctors to properly diagnosis my daughter and restore her to good health. Dear Jesus and Mary, please heal our son, my husband and myself. Please heal us of anxiety, depression, diabetes, heart disease, fibromyalgia, TMJ, arthritis, allergies and asthma. Dear Blessed Mary, Mother of our Lord Jesus, I as that you intervene on my behalf and grant that my son will be able to successfully complete his treatment program, overcome his use of substances and reach his academic potential. I ask for the guidance, as his parents, to help him on his journey. Please bless my son so that he might experience the joy of being a kid again. I trust in Gods divine will to continue to bless our family. Amen. Dear Blessed Mother, grant us the graces we need to navigate the rocky path to holiness and humility. Help us step away resolutely from occasions of sin. When temptation looms, give us the strength to turn away from sin. Give us the strength and wisdom to see God’s face in everyone we encounter this day. Hold our trembling hands as we walk beside you, trusting completely in your love as you intercede for us with your Divine and Human Son.